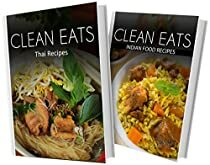 Welcome to the Clean Eats Cookbook Set! A series of Clean Eating Cookbooks for home cooks and food enthusiasts! Looking For New Clean-Eating Ideas That Actually Taste Great? Explore the world, and make cooking an easy task with Samantha Evans, as she takes you through different cultures and cooking techniques all carefully designed to please the avid Clean Eater! Samantha delivers delicious recipes for the entire family. She was a working mother when she decided to write these books, she understands the constraints that come with the territory. Vitamix Recipes – Soups, Smoothies, Juices, and Sauces – don’t have a Vitamix? A blender will do just fine! A Collection of Your Favoruite Foods (All Clean) – miss the pasta, pizza, burgers, and desserts from your diet? It’s all one click away! Italian, Indian, Greek, Mexican recipes, and many more! Always on the go? Check out the On-The-Go Recipe Book or the Freezer Recipes Book to save time! On a budget? Eating clean doesn’t have to be more expensive than it already is – check out the Quick, Cheap, and Clean Recipes – with every recipe taking 10 minutes or less! Slow cookers, pressure cookers, and baking galore – you’l find it all with this amazing set of cookbooks! All recipes are family-friendly, and Samantha goes a step further by providing her very own set of Clean Kids Recipes – great for the whole family – even better for the little ones! Purchase each book one-by-one or check out the compilation books by Samantha to get a discount on multiple book purchases. This is truly – the best Clean Eating cookbook set out – purchase your copies today and see why!